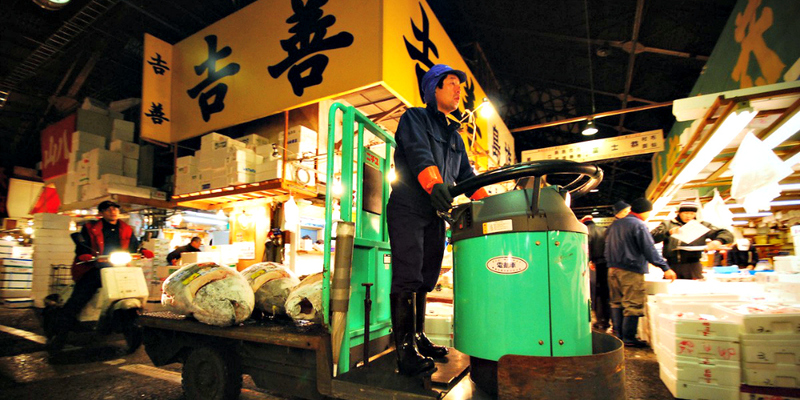 After operating as the world’s largest wholesale fish and seafood market since 1935, Tokyo will move the Tsukiji market to a more modern facility in Toyosu, Koto Ward, in November. The new home is 40% larger and will free up valuable seaside real estate that will be perfect as the city makes plans to host the 2020 Olympic Games. We explored what’s been one of Tokyo’s most popular tourist attractions, before it’s gone. It is 5 AM. 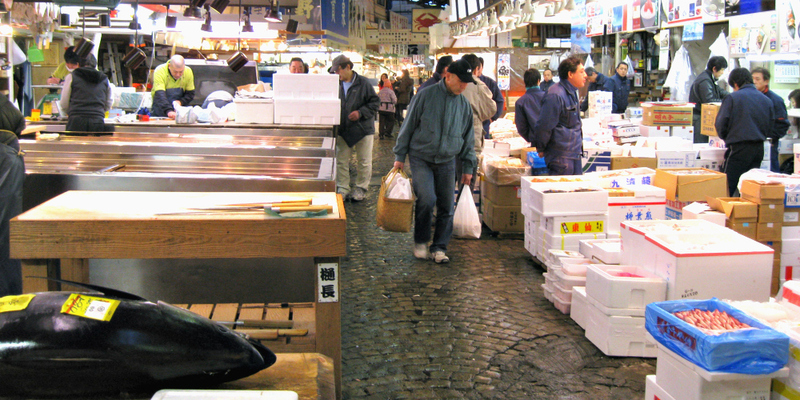 You are following the gaikokujin, or foreigners, through the immense Tsukiji Fish Market. You are all searching for the famous tuna auction. Everyone is lost. The sun has not yet burned off the gloom of the Tokyo morning. It is your first day in Japan and you are fighting jet-lag, hunger, and culture shock. 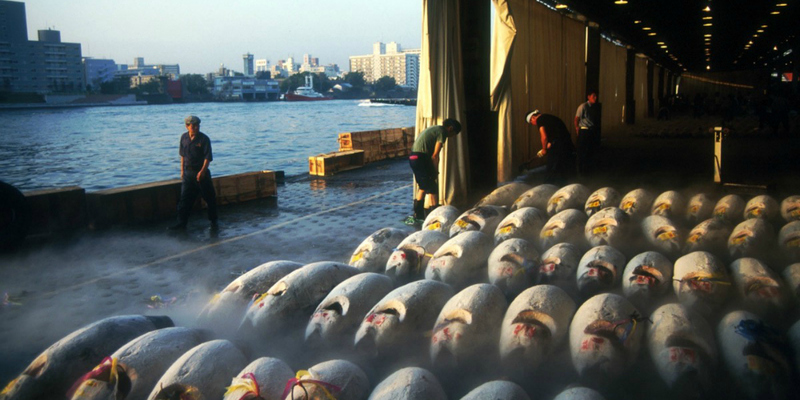 The sight of the frozen fish doesn’t help; bluefin tuna as big as nuclear bombs are lined up by the hundreds, their tails removed, their bellies sliced open, their weight and provenance painted on their flesh with cadmium red ideograms. In the icy, funereal mist, prospective buyers are on the prowl, armed with flashlights, spears, and hatchets in order to extract a little meat from the interiors of the gutted creatures. They delicately rub a small sample of meat between their thumbs and forefingers in order to check for color, texture and fat content. There is nothing dainty about this work or the men who do it. Tough as Yakuza, leathery as longshoremen, the somber buyers are decked out in rain apparel, high boots, and what might pass for hipster headgear in a borough half-way round the world. A touch of the theater and a nod to tradition are apparent in this pre-dawn ritual. Few public spectacles in Japan are without kata, the ancient pursuit of perfection, whether in sumi painting, sumo wrestling, or sourcing ideal sushi. That prize here, unfortunately, is young and sweet and dramatically shrinking in numbers. You want to be a good guest and swallow your judgments, but your stomach is churning and your mind is tumbling. The sad statistics keep rising to the surface: Atlantic and Mediterranean bluefin have been depleted by 60 percent in the past decade; Southern Bluefin in the Pacific has plunged to about 10 percent. The numbers are inexact, slippery. Bluefins cross borders at nearly 50 mph. Fisherman forget to report their catches. Agencies are lax. 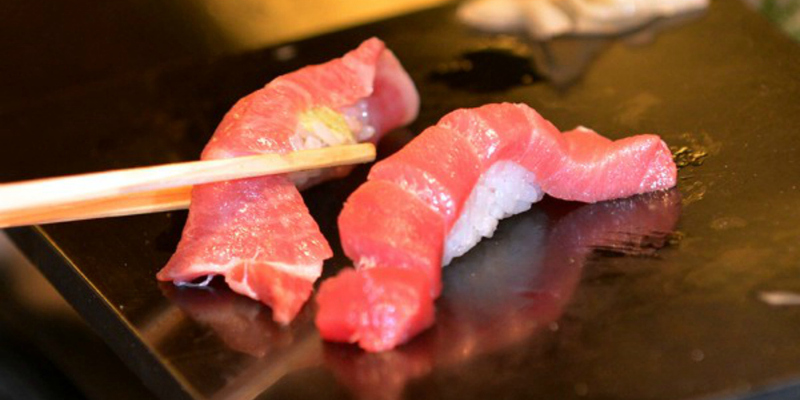 What is certain is that 80 percent of the world’s bluefin tuna is consumed by Japan. Japan without kuromaguro will be like Yankee games without hot dogs, the Fourth of July without burgers, birthdays without cakes. The Japanese know the score; they will suffer first and suffer most when tuna is gone. Japan without kuromaguro will be like Yankee games without hot dogs, the Fourth of July without burgers, birthdays without cakes. Still, they refuse to cut their intake to save face or fish or the future, claiming their consumption is no more foolish than America building nuclear power plants on fault lines or feeding antibiotics to livestock. Eighty percent of the world’s bluefin tuna is consumed by Japan. A cowbell is rung at 6 AM. Several auctions commence simultaneously, like a three-ring circus. Arms flailing and sweat flopping, auctioneers pump up the action like overly caffeinated deejays, creating a rhythm that keeps prices ascending at a steady beat and climaxing with a sale every 5 seconds. $20,000 for a fine frozen hon-maguro is common. Language is not; far too languid. Smirks and twitches and grunts get the job done. Forget your impressions of genteel auctions at Sotheby’s. This is both more subtle and more flamboyant, more wham bam thank you, man. Tourists are now limited to two shifts, 60 at a time, 15 minutes at a clip. They are careful when taking photographs; a flash popping during the auction is akin to obscenities being bellowed during a diva’s aria at LaScala. The Japanese may be hospitable, but rules are rules. Seven of them are exclaimed in five languages throughout Tsukiji (pronounced skee-jee, methinks). 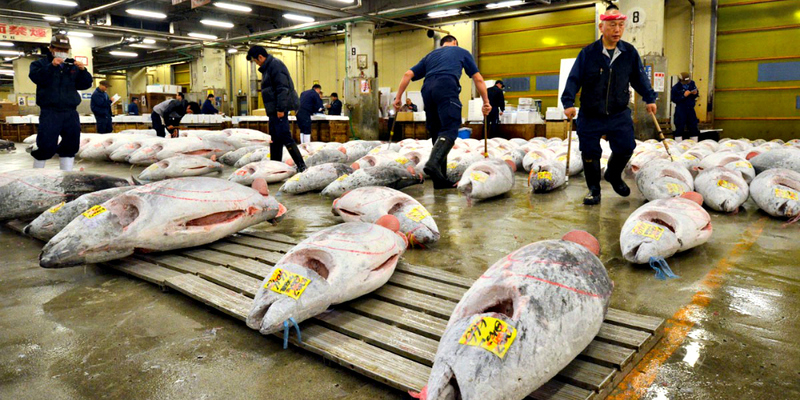 One out of every five fish caught on the planet is sold here at Tsukiji (pronounced tsu-ki-gi). In Tokyo, it’s not yet 6:30 AM. Back in New York, friends are just stepping out for dinner the night before, maybe for sushi, maybe for tuna that was on this very dock just yesterday. Long before the auction wraps up, before all the fish are slid across the floor to be hacked or sawed into chunks for restaurant delivery, I have to disengage. I can’t handle it. Outside the auction center are 43 football fields of frenzy — purveyors and tourists and shoppers and vehicles of every shape and speed: cars, motorcycles, bicycles, trucks, vans, forklifts, wooden hand carts, and motorized three-wheelers known as Turrets. These take corners as if in a chase scene from a comically dubbed action film. The scene is controlled chaos. You feel all the chaos and none of the control. You could easily lose a foot or a spouse, and who would know? Blood and guts are everywhere. Red octopi catch your fancy. A policeman waves his baton, signaling you to move along at once, once again. You bow and scoot. Vehicles whiz by. Everyone knows the choreography except you. You could easily lose a foot or a spouse, and who would know? Blood and guts are everywhere. Yet, there is no discernible odor. There are, instead, ubiquitous grates and drains, and everyone hoses down everything all the time, inside and out. Business is transacted in alleys, in trucks, in offices, in 1,700 stalls. There are mountains of empty white polystyrene packing cases. Besides the fish stores of the inner market, there are restaurants and shops in the outer market that sell anything you need to cook or consume fish: utensils, baubles, bowls, scales, seaweed, knives, and chopsticks. Besides the fish stores of the inner market, there are restaurants and shops in the outer market that sell anything you need to cook or consume fish: utensils, baubles, bowls, scales, seaweed, knives, and chopsticks. The whole Tsukiji experience is comparable to strolling through the fish section of Whole Foods early one morning when the LSD kicks in and the store suddenly turns into JFK Airport and a monster bike rally is starting and a marathon walk is ending and all the cars have Jersey plates and valet service is provided by Hell’s Angels. You are the outsider at the fish anarchist’s ball. The sun finally rises. You are in a state of distress. A lesser man would clumsily dub it Turrets Syndrome. Or say he felt like a fish out of water. A stevedore volunteers to help you. It registers that few Japanese can speak English, or deign to. You pepper this poor fellow with questions. He doesn’t mind. He has a brother in Houston, he likes Barack Obama, he is upset that the market will soon be moving, he recommends a sushi joint. Then he bows and he gets back to work. Wait a second. The market will soon be moving? You are the only American in the small sushi restaurant. You point to items on the menu and smile. Oysters come as large as softballs. Beheaded shrimp crawl along the counter. You keep your counsel. Your wife tries to keep the contents of her stomach in her stomach. None of the locals pay much attention. A half million tourists pass this way every year. The silent tension at Tsukiji is palpable, and not unknown to residents of any vacation town: Tourists are welcome, tourists are feared, tourists are invited to appreciate the culture but not to disturb it. Fish may feel the same way about us. 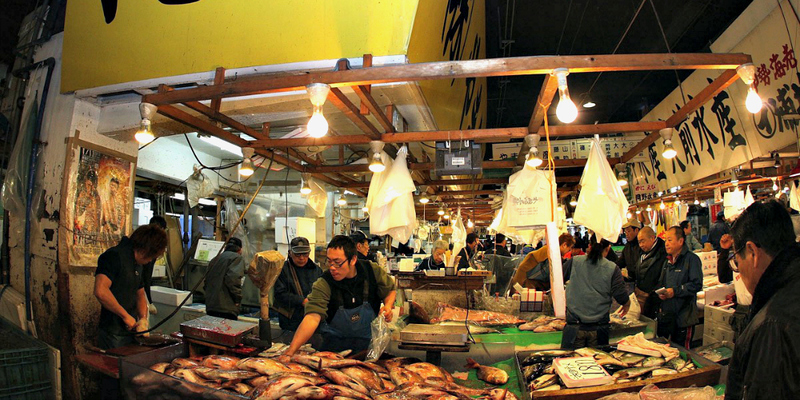 One fisherman fears Toyosu Market will become the Times Square of Tokyo: clean, boring and without character. You read the official handouts: 480 species are on sale here, from abalone to zebra mussels. You wonder why they can’t get along with 477 species and leave the bluefin alone. You would never dare say this out loud. You try hard to eavesdrop. Conversations in broken English are difficult to find or follow. You pick up random details about the impending move. After 80 years, Tsukiji (pronounced tsee-gee) will soon relocate, a mile and half away, to a man-made island called Toyosu. That will put it within walking distance of the Tokyo Olympics, arriving in 2020. It will be a great boon to the local economy. That’s how real estate developers are selling it. But there is a catch: Toyosu is contaminated. The site once housed a gas plant and the soil remains dirty. The deeper they dig, the more toxins they find. Environmentalists are fuming. Unions are protesting. Lawsuits are flying. Fisherman are appalled by both the pollution and the sky high rents. Half of them will not make the move to Toyosu, which will be twice the size of Tsujiki, and fully air-conditioned, and more sanitary, and easier to reach by car. Bridges and boardwalks are being built right now. The estimated cost of the move is $4 billion, though everyone knows it will cost more. Change is never cheap nor uncomplicated. One well-traveled fisherman laughs and asks if anyone would knock down Fenway Park because it is old and outmoded, too charming for its own good. He fears Toyosu Market will become the Times Square of Tokyo: clean, boring and without character. He will not make the move. And what will fill this enormous empty Tsukiji space? Casinos and resorts are the heavy favorites; Tokyo wants to be a global gambling mecca, second only to Macau. Yen, yen, yen. Wagering makes sense. You have been gambling since you got here, dodging Turrets and trucks, consuming mysterious fish, conforming to rules you can only guess at. Strange. You have spent just a few hours in Tsukiji (pronounced squee-gee) and already feel protective and aghast that they want to move it. How dare they? This article was originally published by our friends at Mariott Traveler and is republished here with permission.